At the Sanctuary Garden Resort on Sibuyan Island, Philippines, a pair of Philippine macaques tend to command the visitor's attention. 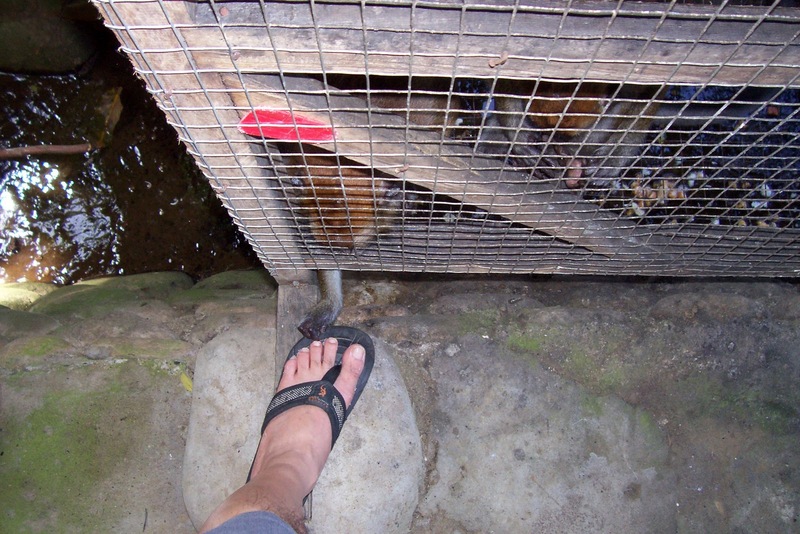 A wire cage next to the restaurant can elicit delight or horror at first meeting with the resident primates. 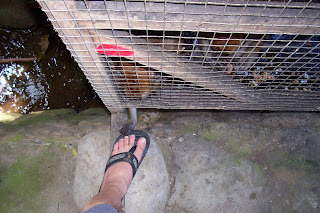 When I first came to the resort, I was a little perturbed and so were a few European tourists who had visited the place. 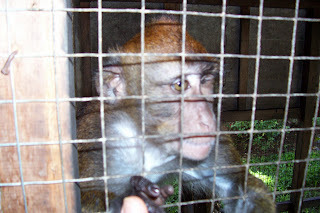 It seemed macaques in a cage did not quite convey the feeling of the word "sanctuary" in the name of the resort. However, there is a touching story to David and JR (yes, they have names too) which the owners, Edgar and Marivic will share with anyone who wants to know. David and JR are not house pets but the owner's little babies. The wired cage is their daytime playpen when not gallivanting in the humongous garden with Marivic, whose passion is her 32 varieties of hibiscus. David, the older of the two, was newly born when the park office in Mt. Guiting-Guiting brought it to the couple to look after. Poachers killed the mother and left the baby orphaned in the rainforest. A year and a half later, the park rangers came again to ask them to look after another baby macaque. 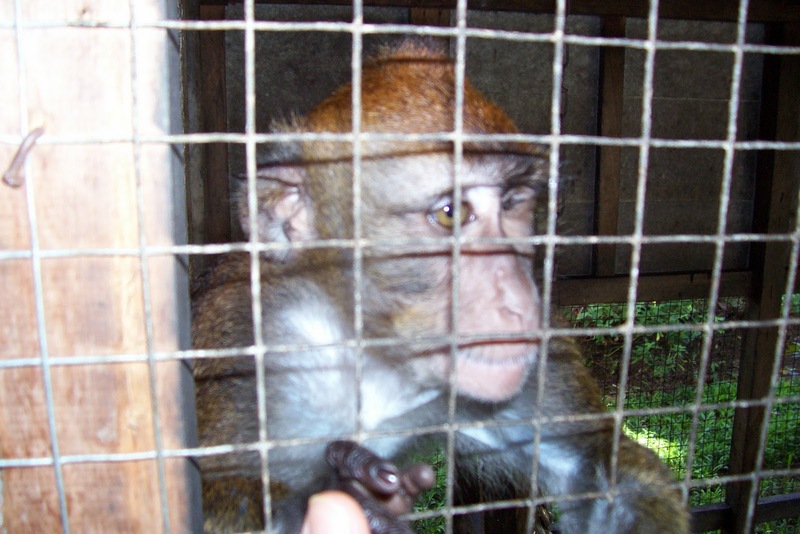 Yes, poachers had killed the mother, and the month old macaque fell from the mother's arm, permanently damaging his right eye. This is JR.
Like all devoted parents, Edgar and Marivic, doted on the two, nursed them on infant formula, taking them regularly to the vet, fed them with healthy stuff like cereals, fruits, berries. Every night, David and JR go through same ritual that kids can relate to. They are bathed, their teeth brushed, and they are diapered before going home. They watch Animal Planet before bedtime, sleeping with their adoptive parents. David and JR have only been around humans all their life. 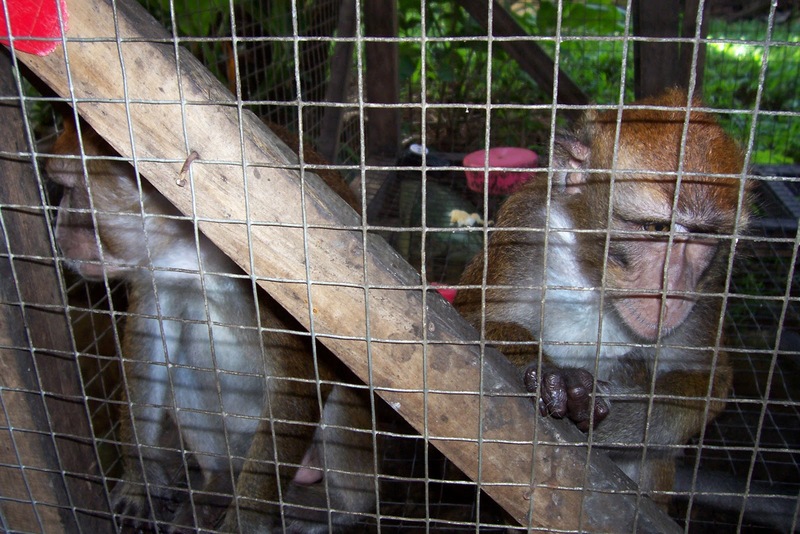 The macaques would no longer survive in the rainforest of Mt. Guiting-Guiting nor could reclaim their place in the world of macaques in the wild. Raising David & JR has become a lifetime commitment for Edgar and Marivic, who have the certificate of custody for them. After a few days at the resort, David and JR became part of my daily routine. Every morning on my way down to the restaurant, I would see David and JR. frolicking in the play pen. They are very friendly, engaging, and in many ways very much like us, people. They displayed a lot of the characteristics, feelings, mannerisms, affection and disaffection of their more sophisticated cousins up the the ladder of evolution. They made me feel that getting to know them for that brief period made my being there totally worth it.